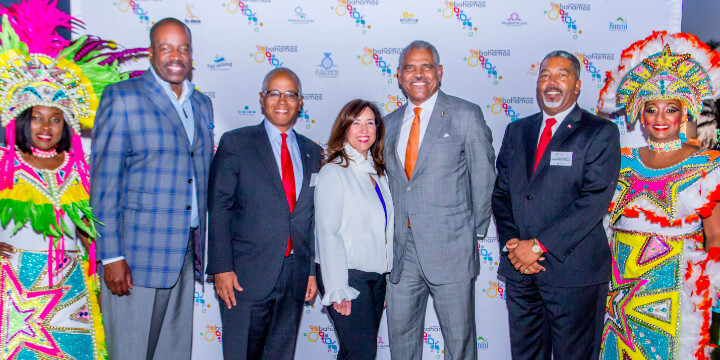 Left to right: Orlando Ashford, President Holland America Line; Dionisio D'Aguilar, Minister of Tourism; Christine Duffy, President Carnival Cruise Line; Arnold Donald, President and CEO Carnival Corporation & PLC; Frankie Campbell, Minister of Transport and Local Government. Fort Lauderdale, Florida - More than 11,000 cruise and maritime industry professionals from around the world, including the Bahamas Minister of Tourism and Aviation (MOTA) Hon. Dionisio D’Aguilar and the Hon. Frankie Campbell, Minister of Transportation and Local Government, attended the recent Seatrade Cruise Global Conference at the Fort Lauderdale Convention Center, March 5-8, 2018. 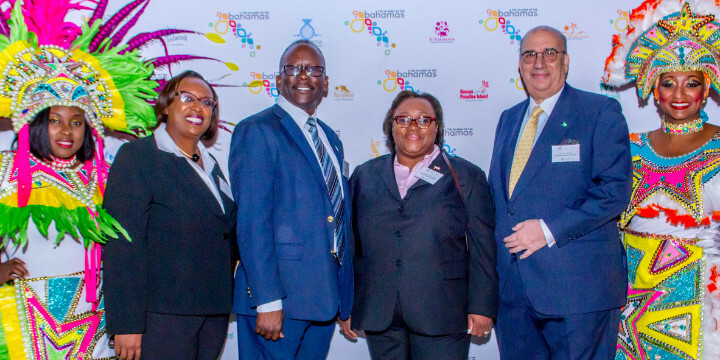 While at the conference the Bahamas delegation met with cruise executives of Royal Caribbean Cruise Line, Norwegian Cruise Line, MSC Cruises, Carnival and Disney Cruise Lines as well as executives of the Florida – Caribbean Cruise Association (FCCA). In addition to the high level meetings held, Ministers D’Aguilar and Campbell attended forums on the state of the global cruise industry as well as several geopolitical cruise sessions. Pictured with junkanoo dancers are Bahamas Maritime Authority (BMA) executives – from left to right: Pam Gomez, BMA board member; Shawn Thurston, BMA board member; Denise Lewis-Johnson, Chairman, BMA and Peter John-Goulandris, Deputy Chairman, BMA. The Bahamas Maritime Authority along with the MOTA sponsored a cocktail reception for over 600 cruise industry executives at the Marriott Harbor Beach Resort. The culturally infused reception, hosted by Cruise Line International Association (CLIA) and Seatrade, featured live Bahamian music performed by Paul Bodie and the Island Force Band, conch fritters, goombay smash and Kalik drinks and a junkanoo rush out by the Valley Performing Stars. 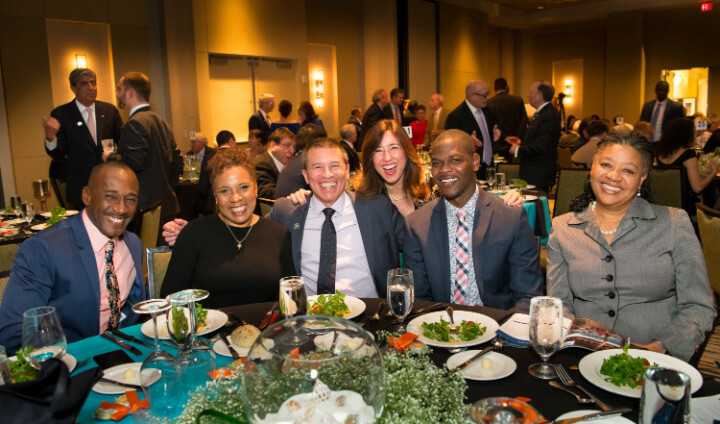 The Islands of The Bahamas were also recognized for its unwavering commitment and support to the cruise industry during the FCCA gala reception and dinner held at the Hilton Hotel. According to Minister D’Aguilar, “The Bahamas remains one of the top preferred destinations for cruise passengers to the Caribbean. We are well positioned to receive a large percentage of the projected 30 million cruise passengers in the months and years ahead and are working on programs to ensure that our visitors experience remain inviting, pleasant, authentic and enjoyable,” he said. Bahamas government executives networking with cruise executives at a gala dinner hosted by the FCCA from left to right: Clay Saunders, Office of the Minister of Tourism; Linda Mackey-Treco, Bahamas Consul General Miami; Andy Stuart, President & CEO, NCL, Christine Duffy, President, Carnival Cruise Line, Travis Robinson, Parliamentary Secretary, MOTA; and Carla Stuart, Sr. Director, Cruise & Maritime, MOTA. “Plans are underway to reopen Festival Place, at the Prince George Dock, by summer of 2018,” he said. Festival Place is home to over 45 local artisans who make Bahamian souvenirs, arts and crafts. “Plans are also underway to expand the port of Nassau in order to accommodate newer and larger cruise vessels, interested in calling on The Bahamas. The creation of a ‘living city’ boardwalk along the sea wall, from Prince George Dock to Paradise Island Bridge is also planned to ignite life on Bay Street,” Minister D’Aguilar said. Additional cruise lines are expected to call on Nassau, Bimini and Grand Bahama beginning as early as Fall 2018 through 2020, further announcements will be made at a later date. The premier industry event of the year, the Seatrade Cruise Global conference has for more than thirty years, brought together global government officials, port authorities, tourism agencies, industry suppliers and cruise executives from around the world, to analyze trends, discuss current issues and conduct cruise business. Currently, The Bahamas is home to seven port of calls for the cruise lines, including: Nassau, Freeport, Castaway Cay, Coco Cay, Great Stirrup Cay, Half Moon Cay and Princess Cays. The Islands Of The Bahamas have a place in the sun for everyone from Nassau and Paradise Island to Grand Bahama to The Abaco Islands, The Exuma Islands, Harbour Island, Long Island and others. Each island has its own personality and attractions for a variety of vacation styles with some of the world’s best golf, scuba diving, fishing, sailing, boating, as well as, shopping and dining. The destination offers an easily accessible tropical getaway and the Bahamian dollar on par with the U.S. dollar. Do everything or do nothing, just remember It’s Better in The Bahamas. For more information on travel packages, activities and accommodations, call 1-800-Bahamas or visit www.Bahamas.com. Look for The Bahamas on the web on Facebook, Twitter and YouTube. 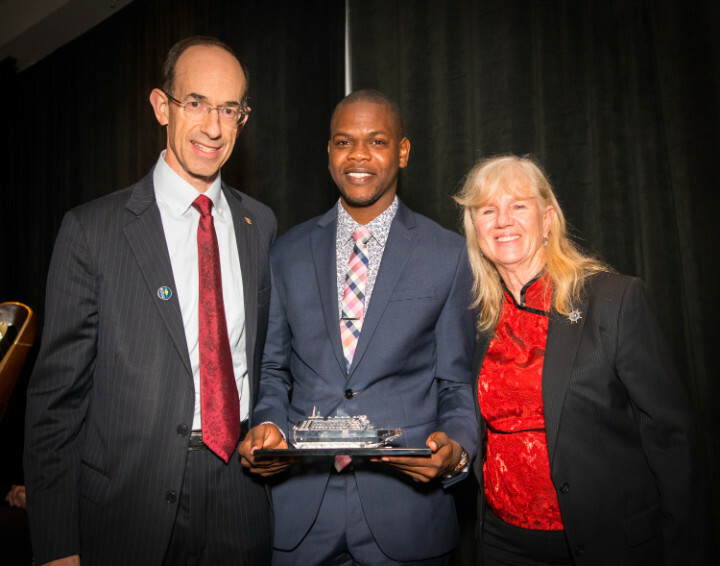 Parliamentary Secretary in the Ministry of Tourism and Aviation, Travis Robinson, accepted the Bahamas’ award from cruise executives – from left to right Adam Goldstein, FCCA Chairman; President & COO, Royal Caribbean Cruises Ltd, Travis Robinson and Michele Page, President, FCCA.